The Newsweek magazine was put up for sale under consignment by Diane Williams of Escondido, Calif., with an initial asking price of $1,000, reports CNET. Williams procured the autograph at the unveiling of the NeXT computer in Cambridge, Mass., in October 1988. At the time, she was working as a senior buyer for Lotus Development Corp., later known as Lotus Software until IBM discontinued the brand in 2013. She approached Jobs and asked if he would sign her copy of Newsweek, which featured a cover story on Jobs' turn in the computer industry, he said, "I don't do autographs." According to Williams, she asked him to "write something from your heart ." Jobs smiled, grabbed the magazine, writing, "I love manufacturing." He underlined "love" and added his signature above the missive. "It was like time stood still," Williams told CNET in an interview. Jobs famously disliked handing out autographs, and was known to refuse requests to sign items presented to him by his considerably large fanbase. 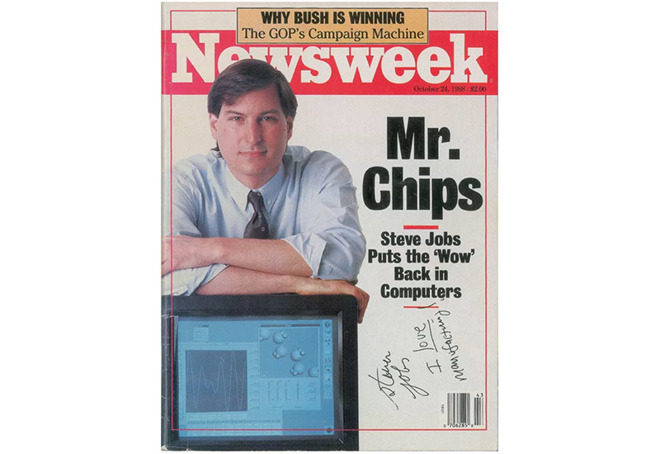 Thus, autographs from the tech guru are exceedingly rare, especially memorabilia like the Newsweek issue. RR Auction said a total of 34 bids from 18 qualified bidders were placed during the auction, which started last week. The final $50,587 price includes a buyer's premium. The auction house is familiar with Jobs-related lots, and in March sold an autographed poster from the 1992 NeXTWorld Expo for $19.600. Four years prior, the firm sold a 1978 contract signed by Jobs for $40,000. Though he died in 2011, Jobs' legacy is still tangible at Apple, from the company's pursuit of design perfection to its corporate structure and beyond. Apple commemorated its co-founder by dedicating the futuristic auditorium that overlooks the new Apple Park campus "Steve Jobs Theater."